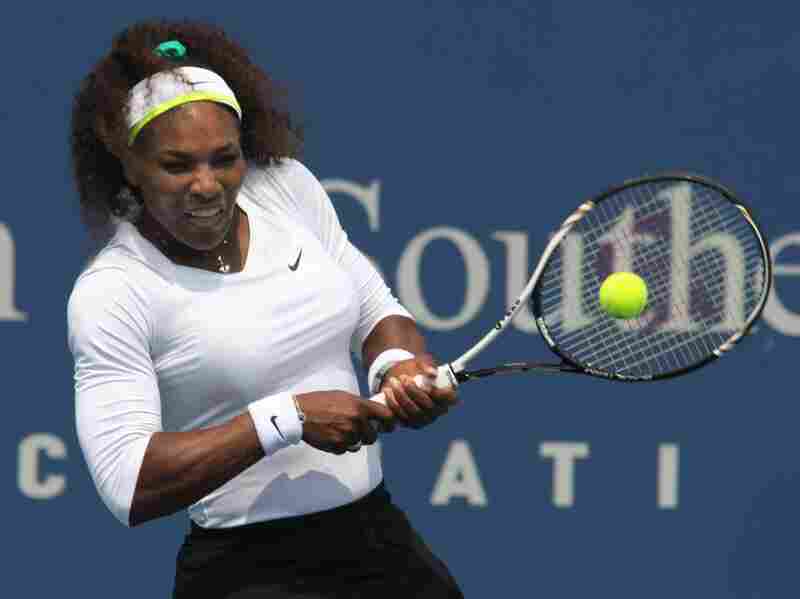 Serena Williams returns a shot during a match at the Western & Southern Open tennis tournament in Mason, Ohio. For the first time in a long time there is actually more than a modicum of interest in the women's side of a Grand Slam tournament. And, of course, it's all strictly due to a party of one: Serena Williams. Not only is she being seriously mentioned now as potentially one of the greatest players ever, but more to the immediate point, after the way she whipped through Wimbledon and the Olympics, there is the sense right now that Serena is better than all her competitors by a margin we haven't seen in almost a century — since Suzanne Lenglen was such a dominant marvel that her popularity forced Wimbledon to move to a huge new grounds. But, of course, it isn't just that Venus' kid sister is rampant upon the court now, with the most powerful serve ever seen in the women's game. Serena is also always, well, compelling. I don't think we should call her a "soap opera" anymore since soap operas are disappearing, but certainly she is, in 21st century terms, a credible one-woman reality show. Just what Serena wears on the court is, according to your taste, either creative, shocking or, simply (to my taste anyway), tacky. When she broke out into an exuberant little jig after she won her Olympic gold medal by annihilating Maria Sharapova, students of street-gang culture — which probably has very little overlap with tennis culture — immediately castigated her for doing the so-called Crip dance, the terpsichorean signature of the murderous gang that competes with the Bloods. Why can't Serena be more like Venus, understated and well-behaved? Why can't Serena be more like tennis players are supposed to be: not disappearing from the tour for alleged lack of interest, not cursing out lines people and chair umpires, not being dismissive in defeat? Serena's most infamous moments have occurred at the U.S. Open, but the undercurrent of race has forever been a constant, and to many fans, she has always teetered on the edge of the outrageous — starting when she and Venus first appeared on the scene, home-schooled in their studies and tennis-schooled in his own very original fashion by her very outspoken father, Richard. In fact, maybe it still stings the purists that Richard's contrarian ways worked; the proof of the pudding is in the eating. Perhaps because tennis is founded in graciousness, those few more volatile stars stand out all the more: from Lenglen herself and Big Bill Tilden to Pancho Gonzales; Connors, McEnroe and Nastase; Billie Jean King in her way; Martina Navratilova in hers. Serena Williams is in that crowd, but as this U.S. Open approaches, it is not her persona but her majesty that is front and center court.